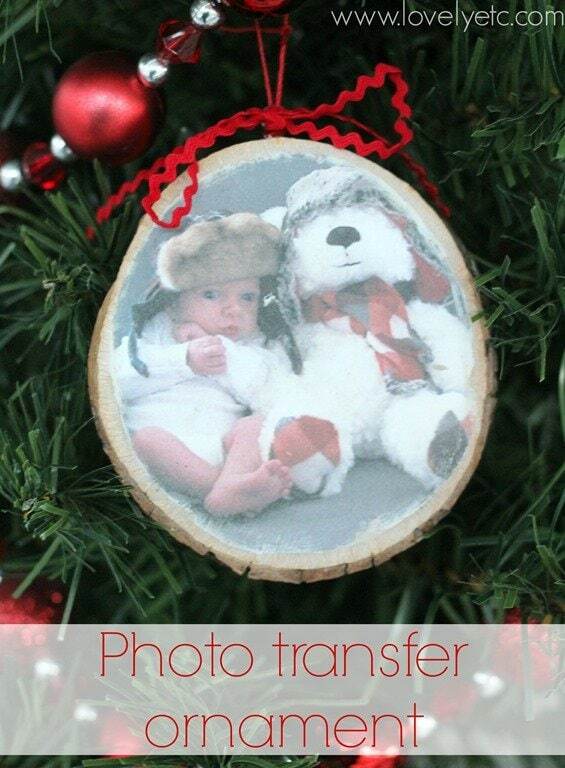 Photo Transfer Wood Slice Ornament - Lovely Etc. Today I have another photo ornament to share. I adore photos and already have several photo ornaments hanging on our tree with photos of my husband and I and the Christmases from our childhood. This year I most definitely needed to add some photos of my adorable little boy and his past two Christmases. 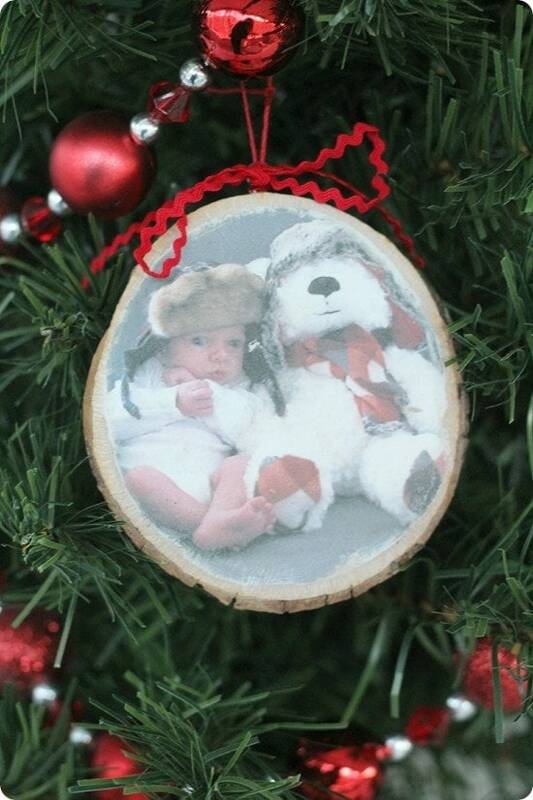 Trace the wood slice onto your photo copy and cut it out slightly smaller than the tracing you made. 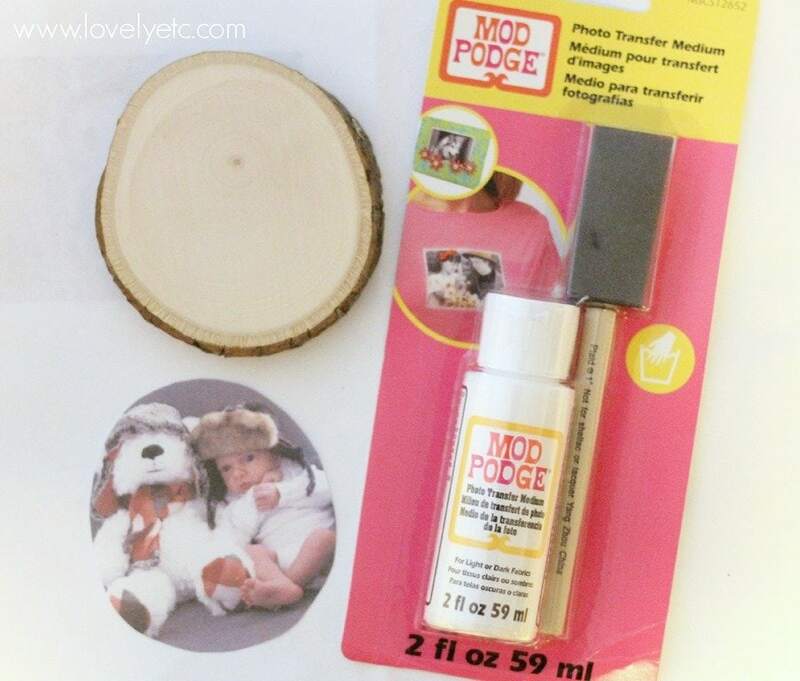 Apply the photo transfer gel liberally onto the top of the photocopy. Press the photo, gel side down onto the wood slice Be sure to smooth it out and press it down firmly. Allow this to dry fully – I left mine overnight and it was ready the next morning. Using a wet cloth, wet the back of the photo. Gently rub the back of the photo until the paper all rubs off. When nothing else rubs off, you are done! Use a piece of fine sandpaper to gently sand the edges of the photo. (You can skip this if you want but it gives it a nice ‘been there forever’ look). Twist an eye hook into the top of the tree slice and add some string and you’re done! 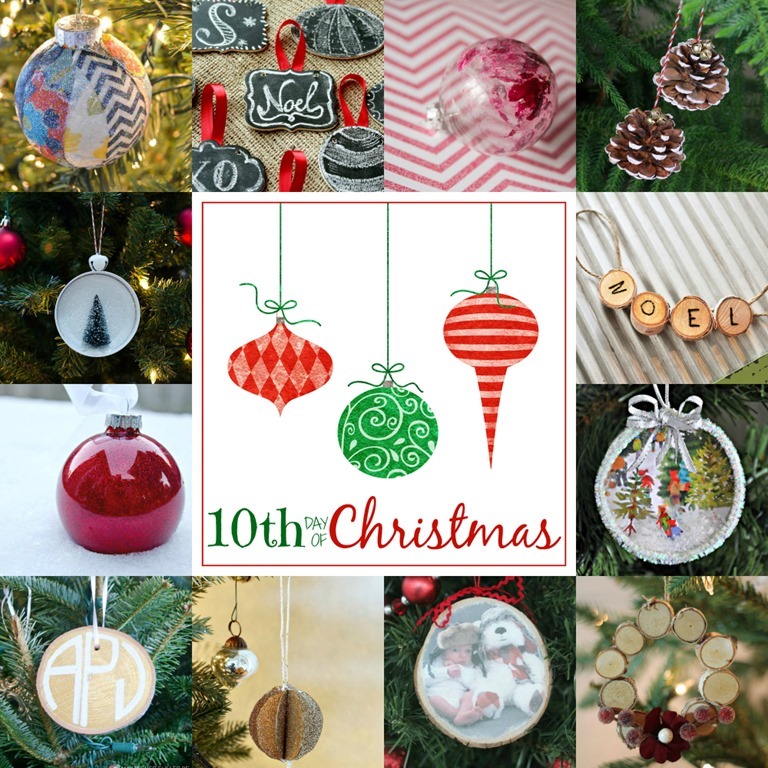 And for your creative inspiration, here are eleven more amazing handmade ornament tutorials! A big thanks to Michael’s for providing a gift card that paid for some of the supplies used in this post. 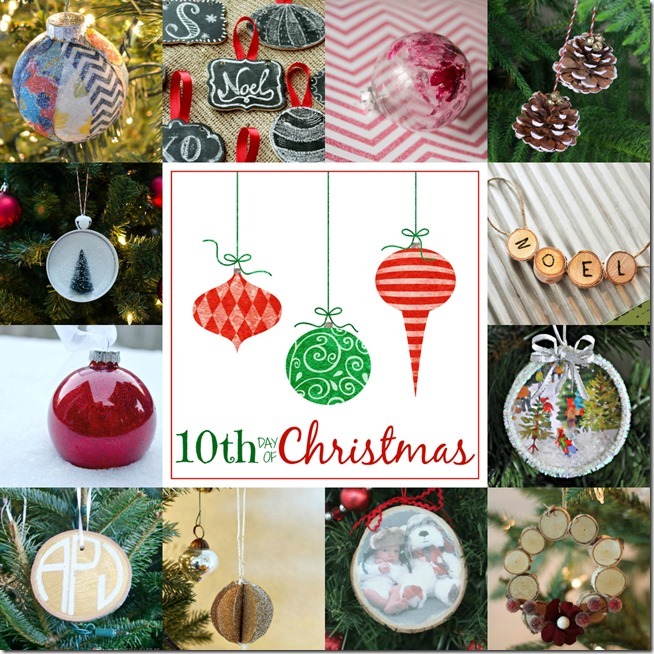 And if you’re looking for more handmade ornament ideas, I’ve got them all ready for you right here. What a great gift idea!! 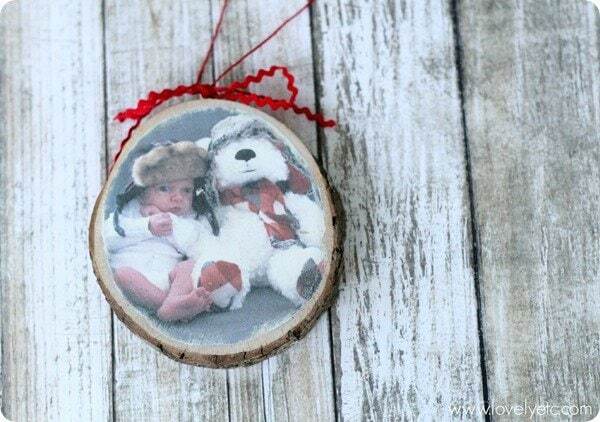 I am totally going to make one for my mom and mother in law!! Thanks Lisa! I hope they love them! What kind of paper are you photo copying picture to? Just regular copy paper? Yes Tricia, just regular copy paper. I made my color copies at Staples but any color copier should work!